Lately it has been extremely hot outside. Too hot that I have been avoiding all reasons to go out for lunch and instead would happily eat my homemade sandwich in the comforts of my air-conditioned office. Oh what I'd give to have a tall glass of Halo-Halo right now. This year, someone predicted that the Filipino cuisine will be the next big thing. I'm really excited for this to happen as I honestly feel there's so much for the world to taste and to appreciate about our local dishes. Set aside the famous adobo, we got our laing, pinakbet, the really comforting sinigang, our wake-me-upper silogs and of course, all our pork dishes from crispy pata down to sisig. 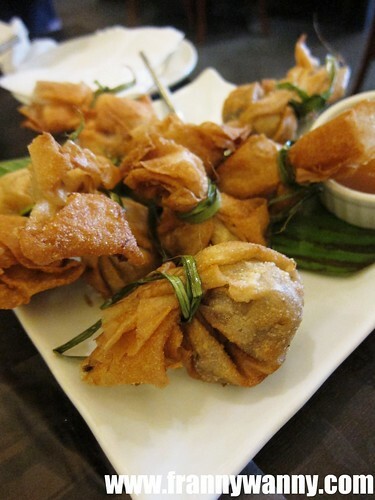 The Filipino cuisine will surely take the gastronomic world by storm, don't you think? Having said that, I really miss Filipino food at the moment. Despite the many restaurants available, if you ask my Mom about her favorite Filipino restaurants, she will probably name 2-3 in a snap. One of these is Mesa Filipino Moderne. Ever since she dined here years ago, this has been her go-to place whenever someone in the family wants Filipino food or we have balikbayan relatives in town. It was pretty much a no-brainer that Mommy would of course take her balikbayan daughter and son-in-law out for lunch to Mesa Filipino Moderne as well. No complains though and in fact, both Paul and I were very excited for this particular lunch as we can't wait to have our Pinoy favorites again. Our meal began with some Tinapa Roll Wrapped in Lettuce which we enjoyed although it was a bit too oily that we could only have a few pieces each. I love anything with Tinapa and this one was even mixed with tomatoes, onions and salted egg. Dipped in vinegar, the best way to enjoy this is to wrap it inside a piece of fresh lettuce the way you'd have some Korean Bulgogi. So, it's basically a roll inside a wrap! My husband Paul is a huge fan of Sisig. Must be the true blue Cabalen in him that made him appreciate this sizzling pork dish starting at such a young age. In Mesa though, they served it quite differently. We tried the Sisig in a Pouch where the chopped pork sisig was wrapped inside a wanton wrapper and deep-fried to perfection. Somehow though, we couldn't pinpoint the sisig flavor and were quite disappointed with this. We should have just ordered the regular kind. Of course, what's a Filipino meal without a grilled platter? Since we were a big group, we had the Inihaw Sampler to share. 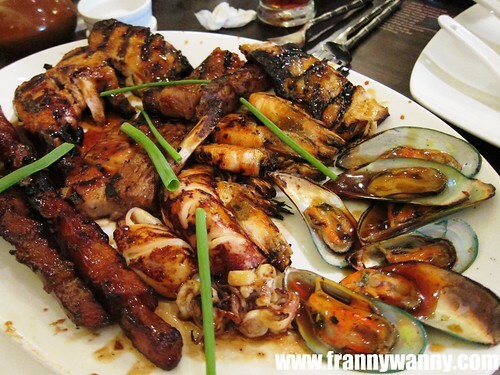 It's filled with grilled squid, chicken, pork bbq, grilled mussels, bangus (milkfish) belly, pork liempo and prawns. It was such a happy looking platter that I was so glad that it somehow stayed stationary in front of me the entire time. Hooray! I loved the pork liempo, the grilled squid and the bangus belly the most. Really good smokey flavor and tender meat! Another must-order is the Crispy Pata. 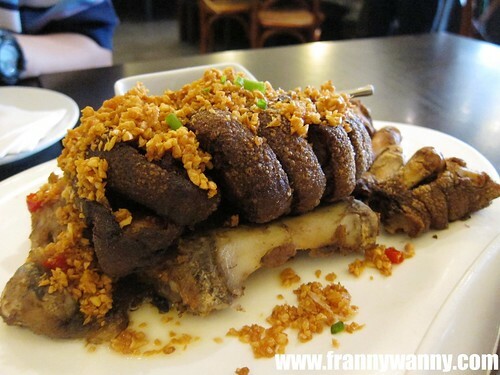 Deep-fried pork knuckles which stays crispy on the outside and really tender meat inside. It was pretty obvious that everyone enjoyed the Crispy Pata as the bone was sparkling clean after. Even Papa who tries hard to avoid fried food couldn't resist the Crispy Pata. Do take it in moderation, okay? We wanted more seafood so we tried the Boneless Tilapia with Four Sauces. Quite interesting as we had fun mixing and matching the sauces till we each found our favorite. The four sauces were -- patis (fish sauce), soy sauce + vinegar mix, bagoong (shrimp paste) and sweet chili sauce. 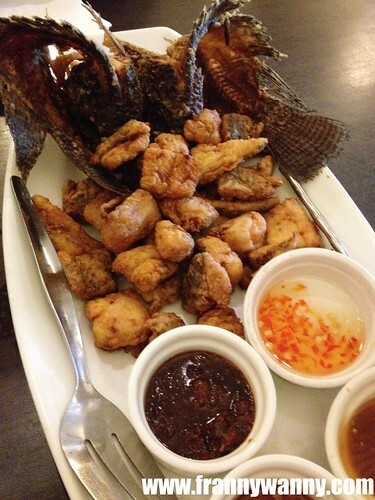 To be honest, I still went for the usual soy sauce + vinegar sauce which I think works best with the deep-fried fish. My only gripe was that the fish wasn't too crispy which I think would have made it even better. I told you I love anything with Tinapa. Not convinced? 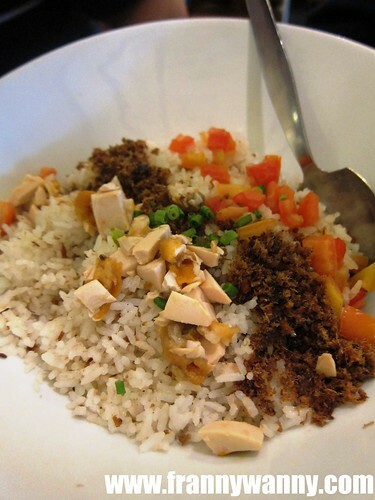 Well for our rice, I ditched the relatively safe yet totally addicting Garlic Rice with Mesa's signature Tinapa Rice. Now, the perfect combination of tinapa flakes, tomatoes and salted egg all mixed into the rice. It was really good and definitely one of my favorites in the menu. It was indeed a very filling meal and we're so happy to be able to have our all-time favorites again. Till our next visit again at Mesa! 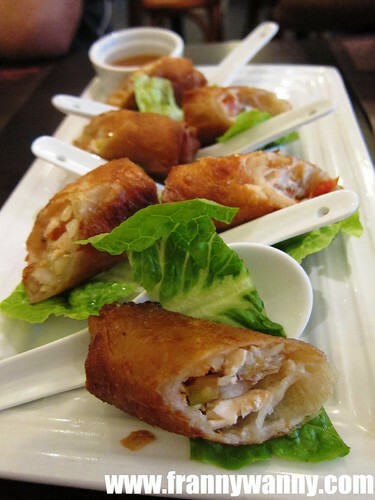 Mesa Filipino Moderne is located at 264 Tomas Morato Ave. corner Scout Fernandez in Quezon City. Call them at 441-5197. They also have branches in Greenbelt 5, Powerplant Mall, Southmall, Ayala Center Cebu, Boracay, Davao and Cagayan de Oro. This is one of my go-to Pinoy food restaurants in the area! Panget and I are quite sentimental with Mesa because its the first restaurant that we went to with Kailee in tow. It was there where we celebrated Panget's bday with his family and it was Kailee's official first day out! Hahaha.. Love the food, value for money and the staff is very nice and efficient!